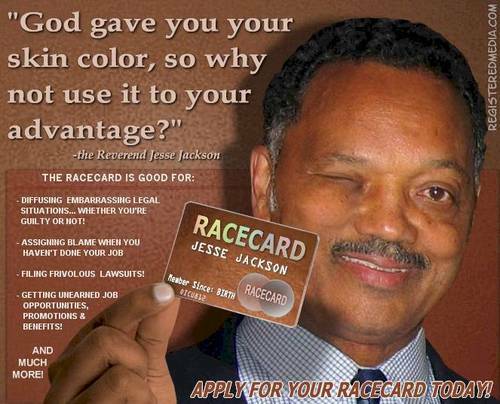 Blog For Freedom: Jesse Jackson's RaceCard - Don't Leave Home Without It! You filthy, nasty person. Put it into your rotting head that there wouldn't be any need for a "racecard" if certain groups of people were not oppressing others. However, compliments for your twisted wit - I could see the humour, but the pathos lies in the fact that you really believe it. Your "race-card" whine is a nonsensical excuse to try and ignore black people when they complain about valid racism. Delighted to Sheila's endorsement of racism as valid! You really need help. You are the type of guy your forefathers stood up against when they came over here to europe to stop the nazis. Luckily the times of the neocons are almost over, but what a price the world had to pay for their power! OJ was guilty and got away with it because of the color of his skin you hypocritical retards. Does the card have a monthly maintenance fee? A friend of mine tried to join the police but was refused because of the colour of his skin... is there a caucasian version of this "race card"? Excellent presentation of fact - keep up the good work! I am so darn tired of black on white racism. You see it more and more almost daily. But Obama and Holder won't prosecute this stuff. Blog For Freedom: Jesse Jackson's RaceCard - Don't Leave Home Without It! It contains the information.